We drove to Pushkin and this is the Czars summer house (or winter...I forgot) but the house was a mile long!!! Gotta pose in front of the Czars house! 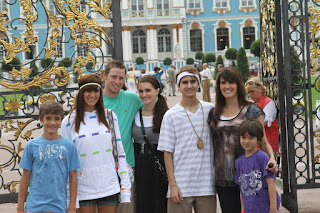 The family in front of the Czar's house! One of the many rooms in the Czar's house. Do you see the paintings on the wall? They are of dead animals. Apparently these pictures were to the increase appetite of the guests. Now Kevin wants to have dead animal paintings in our kitchen. But that won't happen ha. We had to put on these little booties in the house. Oh, this little old Russian lady got pissed and was glaring at me because I was trying to walk up the stairs past her. 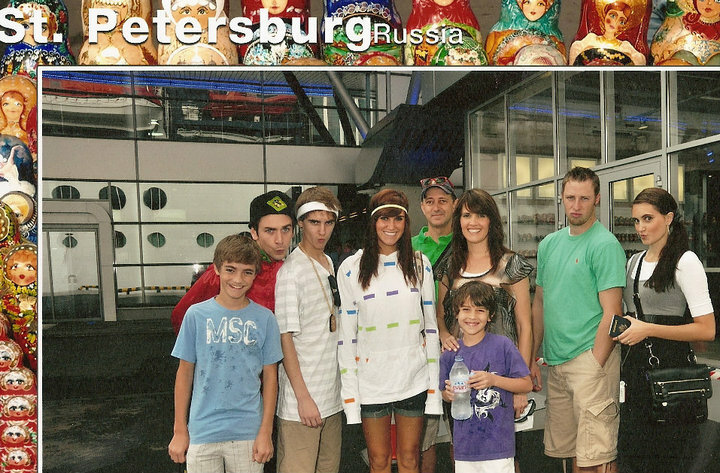 She was in a big group tour and my family had our own personal tour guide. So our tour guide got to cut in the lines in front of the big tours and this lady put her arm in front of me and was glaring at me because she didn't want me to pass her hahaha. The nerve! We were shopping for Russian nesting dolls at a little tourist shop and then we found these...!!! Hilarious huh? Last years BYU football team line up with Max Hall as the biggest doll!!! Insane!?!?! There was only 1 set of these dolls and of course my dad had to buy them. And the little baby one is George. So there has to be some RM out there in St. Petersburg who is pushin for someone to make these dolls for the next LDS family to come in the shop! And it worked! This is either the Hermitage, one of the world's biggest art museums, or the Czar's other house (summer/winter-don't remember)! The beautiful 'Spilled Blood's' church to the left!!! Lunch time at a little local Russian joint! Totally authentic! Russians eat goulash all the time and I absolutely loved their GOULASH!!! SO GOOD!!! Oh, I remember the water here tasted awful and the cups smelled like wet dog haha! You definitely have to be careful drinking water in Russia! One of my relatives has got some serious intestinal problems from drinking something weird in Russia and is forever affected!!! Just an fyi if you go there! So always buy bottled drinks! Aren't these monkeys cute?!?! This was outside the 'Spilled Blood' church! And this totally reminds me of the monkey in the classic movie, The Little Princess! Aw, I love that movie! I will buy that for my future daughter! Of course, I had to bust out my Russian Folk dance moves, just for a quick pic! I told Kevin what to do! Gotta love Folk Dance!!! And Russian dancing is so fun! Dinner on the cruise with Patrick! The show that night was a group of Russian singers and dancers! Totally Folk dance yet again!